These fun dining chairs (remember the green ones I posted a few weeks ago too?) are a great way to add a pop of color and fun trendy fabric and let's be honest, A LOT easier on your pocketbook (the manager also told me they had more in the back, such a rarity at HomeGoods!) $129.99 each! Good stuff! 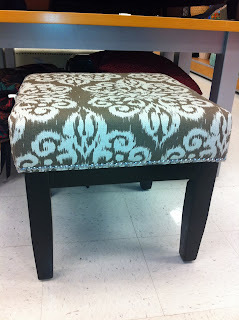 How great is this ikat bench/ottoman from TJMaxx for $49.99? 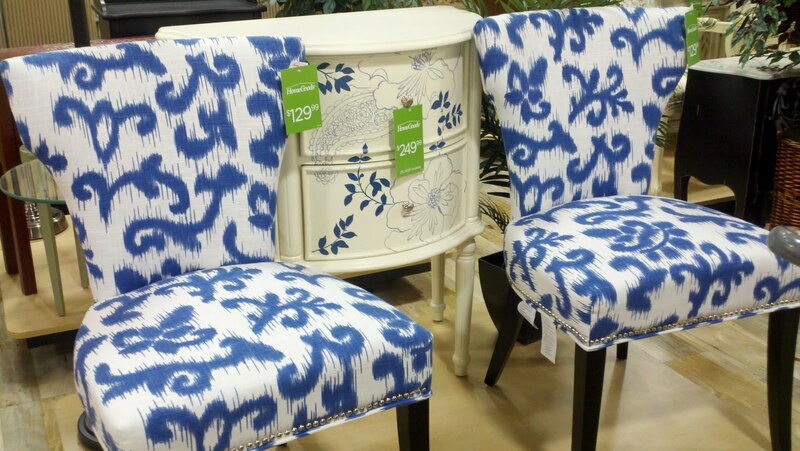 Love the nailhead trim too! This is a random ikat blanket/throw that I found at TJMaxx last summer. I love the citron and the blue mixed together. It is in my master bedroom! It was $29.99. Yes please! You probably saw these ikat pillows in the post- Your Sanctuary at Home featuring my master bedroom. 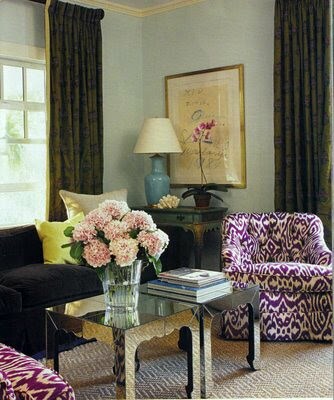 ***Check out today's post from one of my FAVORITE designers, Mrs. Phoebe Howard (based in Atlanta and Florida). She shows you her top ten favorite pillows of the moment and is featuring an ikat pillow herself. Her style in exquisite! 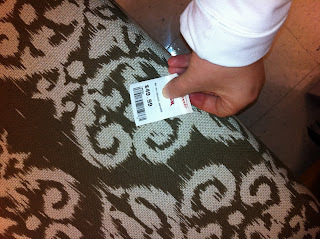 -I love fabric trends, but we don't change our home like we change our clothes, that can get very expensive. This is why I like to add a little pop of trendy fabric into my decor without spending too much. As much as I love the images online and in my design magazines- bright ikat sofas, expensive floor coverings, and upholstered headboards and chairs....it just isn't practical on this girl's budget. 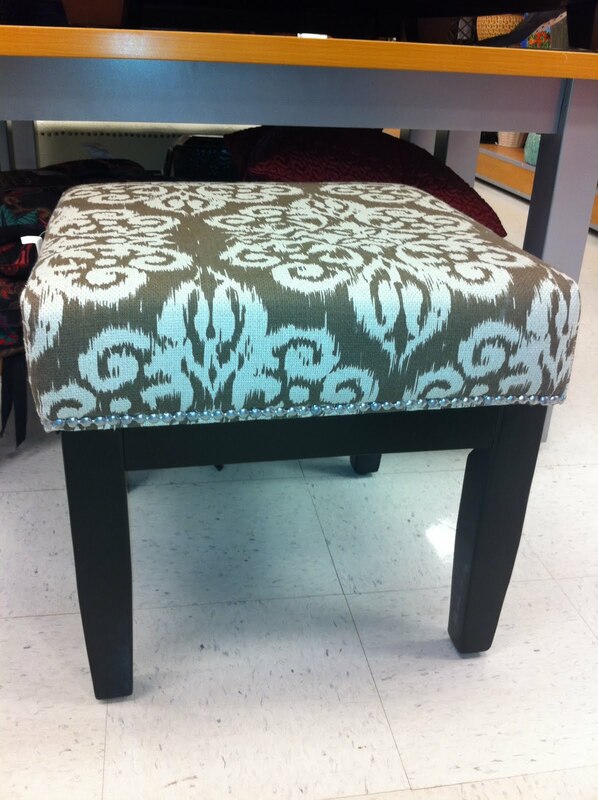 -Buying a small amount of a fabric that is trendy and using a staplegun to recover a small stool or bench is also an easy and inexpensive way to incorporate trends without really 'committing' and breaking the bank. 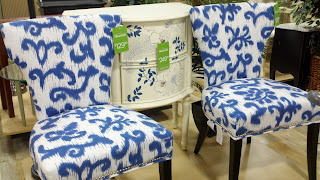 -Case in point, the ikat throw pillows from my master bedroom, $34 each and the turquoise ikat pillow covers, 2 for $24.99! K says 'quit blogging mommy' and wants you to have a FABULOUS WEEKEND! S- loving the blog (and pics of baby K)! 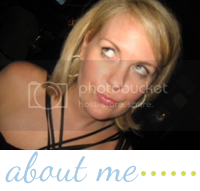 On my blog (which is sporadically about my kiddos and crazy life) there is a blog list to the right. 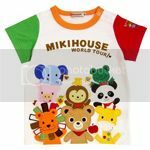 Has some fun blogs that might interest you on home designs etc. Keep up the good work! Ikat is awesome. Great way to add an ethnic touch.